The morning started out bad, but has improved significantly. Nat got sick at about 4AM when no-one was there to catch it. The nursing station has a laundry so we were able to get her blankets washed and back on the bed. Her headache continued in the morning, but right around noon it seemed to lift away. Her catheter was removed this morning and she was able to walk assisted to the bathroom. The nurses also disconnected her from the IV fluids but warned us that if Nat doesn’t start drinking or eating more then it’s going back on again. 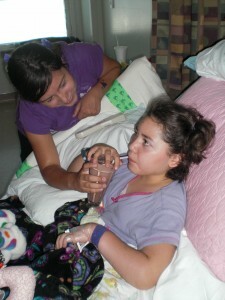 Angela ordered a lunch of chicken nuggets, french fries and a chocolate shake for Natalie, who was finally able to eat! Natalie is able to take the Lortab now, which will replace the intravenous morphine (Lortab has the same pain reducing effects but is orally administered, and lasts longer). Natalie had a bed-bath this morning, and is now wearing her own pajamas again, which is must better than the hospital attire she had to wear for surgery. Angela also made sure to brush her teeth. We were able to get her into a wheelchair and take her out to the 3rd floor playroom, where she drew a picture and played the Candyland board game. We went down to the first floor and spent a few minutes outside before going back in and visiting the hospital gift shop, where Natalie found “Squiggles” the elephant to bring back up to her room. That excursion exhausted her so we’re currently back in her room. She’s asleep. ← Natalie is out of bed!